Yoav and I just returned from a trip to Indonesia to help with the set up and operational instruction for 2 Power Pallets there. They are being integrated into a pilot stage “Village Hub” project. This pilot is located next to a palm sugar factory run by the Masarang Foundation (http://www.masarang.nl/). The factory uses waste geothermal heat from a 35 MW geothermal plant to dry and prepare palm sugar. This sugar is prepared from the sap of the Arenga Palm (http://en.wikipedia.org/wiki/Arenga_pinnata), a species studied by Willie Smits who studied forestry in the Netherlands (and gave a great TED talk (http://www.ted.com/talks/willie_smits_restores_a_rainforest.html). The sap is collected by bruising the fruiting branches, which release the sap, up to 100 liters per tree per day. It can be processed into sugar and ethanol. The Arenga palm can grow on poor soils, allowing deforested areas to be reforested, acting as a nurse tree to re-introduce more diverse species (see Willie’s TED talk above). The Village Hub concept is to create smaller scale plants that can operate with zero external inputs and zero waste. These would collect sap from a collection of local farmers allowing economic opportunities to stay and protect reforested areas. The Hub would provide extra electricity to the villages and a medical office with internet access for doctors. The Power Pallet would provide electricity for plant operations and other uses. We successfully installed and operated the Power Pallets and provided training to the workers at the facility, who were quite excited to be involved and learn about gasification and the equipment. A view of the pilot factory – designed to be zero waste – the sugar operation (upper left) makes sugar/alcohol/distilled water, wastes feed pigs, pig and human waste feeds a biogas digestor (lower right), CO2 from alcohol fermentation feeds algae in pond. Algae feeds pigs. Remaining nutrient rich water into rice field (lower). Going over the 20 kW control panel and startup check list. Given the long rains and >30% MC fuel, we primarily used crushed coconut shells which worked great. Chipping wood with a mill, consideration of fuel moisture in the humid tropics is key. Preparing a 10 kW Power Pallet for operation. Glad to meet the web site in gasifier specialy to your project apl in Indonesia. Please send further information about it. We’d love to talk to you about palm fiber and nut shells for possible use with our system. 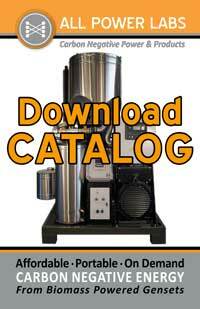 Please contact our Sales department sales@allpowerlabs.org or +1-510-845-1500 10am-6pm Pacific Standard Time. I am Jefri from Indonesia and live at Balikpapan, a city at borneo island. I check this website regularly, it is interesting to find out that there is aplication of biomass electricity here at Indonesia. In my area,I think we need these system. Can we talk about it ? Finally guys, you have come to land of biomass. As expected, you have done a good job, again… For me I always wanted to come and visit you and attend your work shop. There is so much to learn and share info. Here we have done gasification from wood chips, rice husk, chicken waste and so on. FYI, palm fiber is hard to gasify unless dried, drying needs so much energy, unless dried by sun. Most companies don’t even burn EFB. Nut shells (Changkang) would gasify better than wood chips ( similar to hazel nut or walnut shells), we are planning to try that soon. Shells already sell as biomass fuel for a good price, most palm oil factories burn them in boilers, I am against that, if they are gasified would bring more energy. Some info, palm shells 450 rupiah ( 0.05 cents) per kg hard to find, usually sold by long term contracts, coconut shells 750 rupiah per kg ( 0.083 cents) available everywhere in Indonesia. Fire wood is 150-200 rupiah per kg ( 0.016- 0.022 cents) available in every village. Is this machine only capable of wood pallets, coconut shells, nut shells? What about market biomass waste such as: vegetables, leaves, etc? Or do you recommend more biogas plant for these materials? I am an engineer who working for energy technology center in Indonesia. Part of my tasks is giving recommendation of energy technology to be apply in Indonesia to support the distributed electricity system programs for remote areas. It is interested to learn yours integrated gasifier system. Sound to be a handy system that might be able to provide electricity in a remote area where biomass resources available. Anyway, do you have a technical performance data base on your field running test? If you have any information on that matter please send me for references basis. @ Marina: Yes our gasifier / Power Pallets are set up for chunky woody biomass-10mm-50mm in size. Call: +1-510-845-1500 – 10am-6pm Pacific Standard Time. For all interested in biomass gasifikasi in Indonesia. APL team installed a gasifier (10 kW power pallet – gasifier + gasengine and generator) in Yogyakarta at Institute UMY (Universitas Muhammadiya Yogyakarta). This gasifier is intended as a demonstrator for all those that are interested to see such system working and even to do research with your own feedstock.